Home » Gossip » With parents like these Lindsay Lohan never had a chance! With parents like these Lindsay Lohan never had a chance! Usually I have zero sympathy for Lindsay Lohan. After all this is a girl who was willing to let her assistant take the fall for her car crash on the Pacific Coast Highway last summer and who was late for court on Monday because she skipped her flight from New York to LA on Saturday in order to hit up a club. 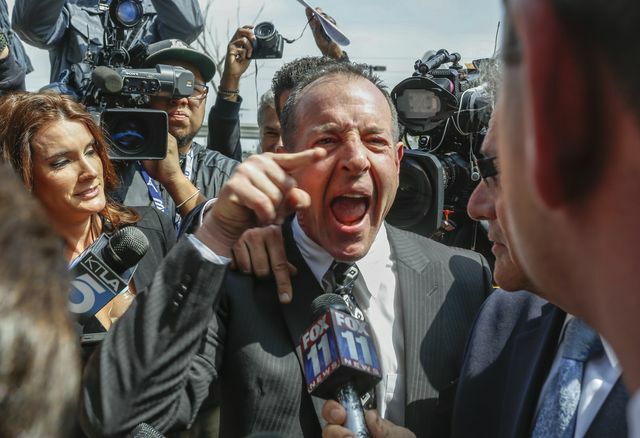 However, I do admit to feeling slightly sorry for her after seeing how her father Michael Lohan verbally attacked her lawyer Mark Heller outside the courthouse. This man is addicted to fame and notoriety and incapable of dealing with anything privately. While I agree that her attorney seems a little sketchy, the man did manage to save her from doing any real jail time and seems to have gotten Lindsay the best deal possible, 90 days in a secure rehab facility, which she badly needs, along with community service and 18 months of therapy. But this wasn’t enough for Michael who hijacked Heller’s press conference, shouting “What are you still doing here?” before launching a bitter attack on him. He added: “This guy is trying to cash in on my daughter’s notoriety for his own professional interests,” then accused the lawyer of owing him money and claimed he isn’t licensed to practice law in New York. It’s no wonder Lindsay is the mess she is with her dad doing everything he can to remain in the public eye and do not even get me started on her mum Dina, who seems happier to party with her daughter rather than send her to much needed rehab! Maybe all that court ordered therapy will help her realise the only way she is going to get better is to stay the hell away from her deadbeat parents.